Those of you who regularly read our blog, or keep up with our Twitter feed, will know we’re good friends with the chaps at Master of Malt. Whenever they’re in Edinburgh we do our utmost to squeeze them in to our schedules and meet them for a drink (or six) in one of Edinburgh’s delectable drinking dens. We love their innovation and we love their product creation but most of all, we love their party animal ‘go big or go home’ attitude when they’re in town. Towards the end of last year they started releasing single malt and single grain whiskies under the ‘That Boutique-y Whisky Company’ brand. “But why such a tongue-twistingly lengthy and unnecessarily difficult-to-say name?”, I hear you ask. Well, bureaucracy dictates that Master of Malt could release a single malt whisky without naming the distillery, or a single cask whisky (both of which they’ve done), but they couldn’t release a straight up single malt whisky and say which distillery it was from. Are you still following me? If you are then you may think this is all a bit ridiculous. Anyway, to remedy this strange little conundrum they set up ‘That Boutique-y Whisky Company’. Under this disguise they are free to bottle and sell single malt, and single grain, whisky to the masses. So to the bottles then. First off, none of the 50cl bottles have an age statement. According to Ben Ellefsen, Director of Sales at Master of Malt, this is because “we’ve got absolutely no idea what age each of the batches are going to be until we get the opportunity to purchase the stock, and having a range with age statements that could conceivably bounce around (even within individual distilleries) by as much as 30 years between batches doesn’t make sense.” Fair enough. Ben also goes on to explain that, for example, “the Macallan in this first batch contains a bulk of reasonably old whisky, but it’s had a portion of much younger, more heavily sherried Macallan added to it in order to give it a bit of a lift. This has led to what we think is a superb flavour profile, but would give a somewhat misleading age statement.” Also fair enough, if you ask me. The bottling strength is simply determined by the natural strength of the whisky once the batch of casks have been vatted together. 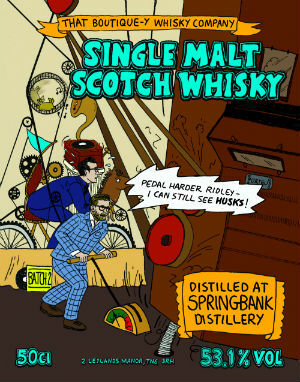 As you can see from the photo above, each batch also has a cartoonish style label which incorporates an urban legend or two about the distillery, pays homage to the artist and may even feature depictions of various famous whisky folks. 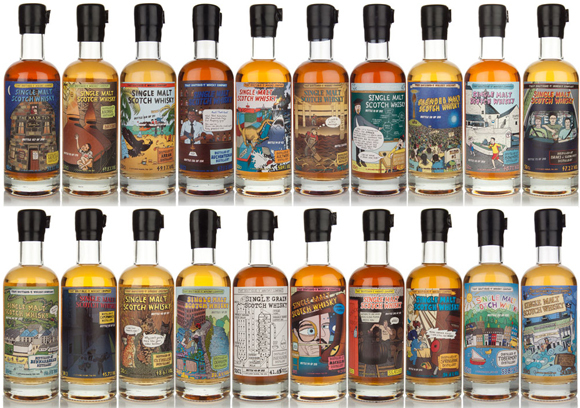 Imagine Marvel Comics meets the whisky industry and you’re on the right track. Now you have a reasonable idea of what they’re all about, let’s take a look at three first batch whiskies from Invergordon, Tormore and Springbank, and their respective quirky labels. Nose: Very fresh, with green apples, sugar cane and maple syrup over pancakes. There’s also a fair whack of toffee and caramel, with some freshly chopped logs adding further depth. Palate: Chocolate éclairs, treacle toffee, vanilla and custard creams. Some wood spices, mainly nutmeg, also appear with the wood coming through towards the end. Finish: Banoffee pie! Really sweet and creamy and rather moreish. Nose: Crushed white pepper, peaches, sugar puffs, Belgian waffles, Demerara sugar and Jamaica cake. Rich and sticky sweet. Palate: A chilli nip to begin, then cinnamon, dry wood chips, ginger and cherry cake. On top there’s a creme brulee and spun sugar thing going on. Finish: Lots of wood and spices – tongue tingling! Nose: Dirty engine oil, BBQ embers, salted limes and salt and vinegar crisps. There’s something herbal too – flowering gorse bushes and heather. Palate: A big smoky citrus hit – salted limes and peat smoke. Really quite ashy with a dash of oak. Finish: Lingering smoke and salty sea spray. Overall: Three very interesting and delicious whiskies. 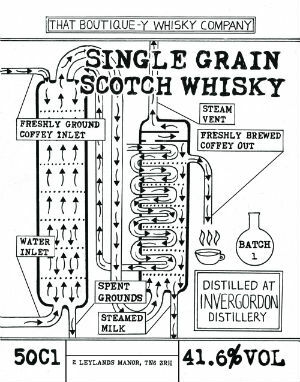 I know a lot of people aren’t big fans of grain whisky, but as someone who really appreciates a good grain then the Invergordon really hits the spot for me. The Springbank was a solid dram too, which keeps the peat freaks happy. It’s perhaps more ashy than other Springbanks I’ve tried which, again, keeps things interesting. 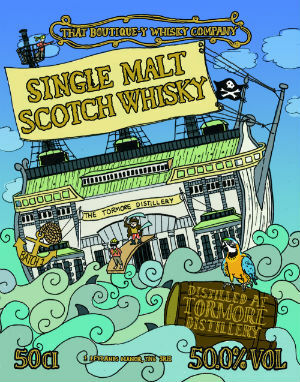 The Tormore is a spanking dram though – lots of lovely spices mixed with a vanilla creaminess and sugary sweetness. In Part 2 I’ll be taking a trip to the islands, with the first batches of Tobermory, Arran and Bowmore all being given the EWB treatment. This entry was posted	on Tuesday, June 18th, 2013 at 2:00 pm	and is filed under Reviews. You can follow any responses to this entry through the RSS 2.0 feed. Responses are currently closed, but you can trackback from your own site.